Craig Levein has revealed Uche Ikpeazu could become the latest Hearts player to earn a contract extension. 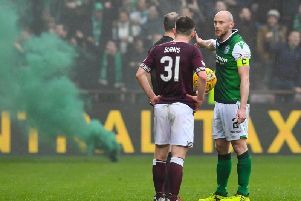 The powerhouse frontman made his return from a four-month lay-off following a foot operation against Livingston on Wednesday and now Levein is keen to tie him down beyond his current deal, which expires at the end of next season. Levein has already handed out new deals to skipper Christophe Berra and fellow defenders John Souttar and Michael Smith, while he hopes to secure key men Steven Naismith and Arnaud Djoum on fresh terms before their current arrangements expire at the end of this term. Asked if he was any further forward on those two deals, the Hearts boss added: “I’m still working on everything else. “Because I’ve chosen to make contract extension offers at this time, it doesn’t mean that people are going to sign. There are negotiations that have to happen and other factors that have to be taken into account.